Senate Race between Governor Rick Scott (R) and Incumbent Senator Bill Nelson (D) in a statistical tie 42% to 41% with 11% undecided. In August 2018, Scott with 45%, Nelson with 39% and 16% undecided. Scott has a slight edge in overall job approval with 43% of voters approving Scott’s performance as Governor and 38% disapproving. Nelson has a 37% approval for his job as Senator and 37% disapproval. Tallahassee Mayor Andrew Gillum (D) has 41% of the vote and Rep. Ron DeSantis (R) is at 39%, 15% were undecided. 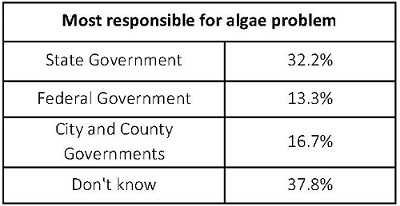 Voters were asked whose policies they believe were most responsible for the algae problem along the Florida coasts. Voters were asked to indicate if they support or oppose a list of policies. Those voters who are supporting the Republican candidacies of Scott and DeSantis oppose raising the minimum wage, banning assault weapons and on restoring felon voter rights. For example, on the issue of the $15 minimum wage, those who support it break for Nelson 60% to 25% while those opposing break for Scott 72% to 16%. In the Gov. Race, those in support of the raise are breaking for Gillum 54% to 26% while those opposing are breaking for DeSantis 64% to 22%. Similarly, on the issue of restoring felon voting rights, those in support break for Nelson 58% to 29% while those opposing break for Scott 69% to 18%. Gillum gets 54% of supporters with 29% going to DeSantis while those opposing are breaking for DeSantis 61% to 25% for Gillum. The assault rifle ban follows the same trend with supporters of the ban breaking for Nelson 59% to 28% for Scott while those opposing are breaking for Scott 64% to 21%. In the Gov. Race, supporters of the ban are breaking for Gillum 55% to 30% for DeSantis, while those opposing are breaking for DeSantis 55% to 25%. On the issue of requiring a two-thirds vote of the Legislature to approve any new or increased taxes or fees, rather than a simple majority partisanship gives way as there is no statistical difference between supporters and those opposing the issue. Supporters of the 2/3rds vote for increase taxes break for Scott 45% to 43% as do those opposing the issue at 47% to 40%. In the Governor’s race supporters are breaking for DeSantis 44% to 39% while those opposing are split at 43% for each candidate. President Trump has a 39% approval and 47% disapproval which is his lowest numbers since August 2017 when he had a 37% approval and 47% disapproval. In last month’s poll (August, 2018), Trump had a 43% approval and 45% disapproval. The FAU BEPI Florida poll was conducted September 13-16, 2018. The sample consisted of registered voters who said they were more likely to vote than not, n=850, the poll’s margin of error (MOE) of +/- 3.3 percentage points. The data was weighted by ethnicity, region, party affiliation, gender based on a 2016 voter model. It is important to remember that subsets have higher margins of error, as the sample size is reduced. Data was collected using both an Interactive Voice Response (IVR) system of landlines and an online panel provided by Survey Sampling International, SSI.